My previous trip to Madikeri/Coorg 2 years ago was mainly due to the fact that we wanted to go on a drive some place over the weekend. But when hubby put forth the idea of a long break, Coorg came to our minds instantly. The main purpose of this trip was just to do nothing. What better place than Linger which claims the same phrase as their tag line - "DO NOTHING"! While hubby decided to stay there for 5 nights, I planned to join him a little later since I didn't want to exhaust all my leave days on this trip (we followed it with another amazing trip, watch out for the next post!). Having booked a KSRTC to Bhagamandala, the challenge was to figure out where the Mysore Road Satellite bus station was. It turned out to be an easy task and I reached the bus stand 2 hours earlier than the departure time. The clean bus station with good seating facility and the few magazines that I picked up from the nearby stall helped me pass the 2 hours quickly. The bus reached my destination bus stop at 7:15 AM on a drizzling Saturday morning. 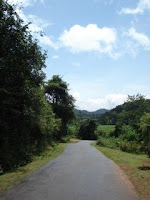 It was a deserted road and I saw a narrow mud track on the left side. I started walking for about 10 minutes, only to realize that this road was leading nowhere. After a few more steps, two angry dogs was staring at me in the middle of the mud road and started to bark aloud, recognizing the stranger in town. Though I panicked, I didn't show them any fear on my face. I slowly took a turn and started walking back, praying that they don't chase me. Once the intensity of their voices simmered, I caught up speed and reached the main road. I know my hubby was waiting at the bus stand but I can't tell him where I was since both our phone signals were down in this location. Fortunately, a middle aged lady was walking past me and she helped me locate the right bus stand. After seeing my hubby, I heaved a sigh of relief. What an adventurous start! After entering our room, my first instinct was to take a look at the much-publicized attic bed :-) Though my body was begging me to take a nap, my mind was so fresh with the greenery and mild drizzle. After a quick cup of coffee, hubby and I went for a walk around - deserted roads, green fields, peeking sunshine and cool breeze. It was a bliss to take a walk in such a breathtaking atmosphere. One of the best features of Linger is its location amidst the mountains and paddy fields. In the afternoon, we went for a drive to Talacauvery. Though it wasn't raining until we reached the temple, the dark clouds started pouring down heavily when we started climbing the steps towards the view point. It would have been a beautiful view, had the mist not engulfed the whole place. As the rains were heavy, we came back and sat in the verandah, reading our books. Linger has a small collection of books and some board games. I was glad to see Sidin's Dork among the collection. It felt good to finish this fun novel in 2 days. The next morning, we went for a drive to a border town named Karike, around 30 kms from Bhagamandala. It was a fantastic drive through the dense forests and waterfalls with no traffic on the narrow single lane road. Sipping tea (I'm a tea person even in Coorg! 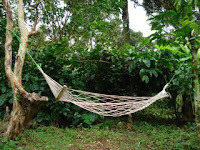 ), it was so relaxing to sit in the verandah and observe the time pass slowly with the company of birds and insects. It was a homely place with no intrusion of privacy by the caretakers. The food was mainly of simple Coorgi dishes. The only point to be improved was that the food could have been prepared, especially the pooris/chapathis just before we started our lunch/dinner. With the cold weather, the food tends to become rubbery. The return drive to Bangalore was smooth, with a few pitstops at Cafe Coorg and Kamat. Overall, it was a very good trip to Coorg, yet again. P.S. Carry enough mosquito repellants or else forget your sleep! :-) We went well prepared for them.